I’m a wanna-be-gardener. I just play at it, but I have fun doing it. I don’t prepare my soil well enough, adding compost or checking for proper alkalinity or acidity. I’ve planted things in the wrong location for it to flourish. I’ve let some plants stay out all winter which has sapped them of strength and beauty. Miraculously, some have survived. And I am amazed. Sill, I’ve had some success with my accidental way of putting things into the ground. I have a few early bulbs that surprise me through a late season snowfall. In spring my yard glows with all shades of pink, red, and purple while the azaleas are in bloom. All summer and fall I enjoy how the colors change from season to season. It’s God’s lavish way of producing fruit from my shabby labor. I’ve got plenty of garden books and read them randomly when I need information. When I follow the directions, it seems to help. Go figure. So I had these two blank canvases on either side of our garage door, all white and asking for something colorful there. I tried placing large clay pots in the area one year, filling them with annuals that bloomed and looked pretty for a season. But then I moved the pots somewhere else. Later I envisioned small topiary trees growing all perfectly round and proportional, looking artistic and lovely. Ah, but what I wanted would cost more than I wanted to spend. I needed another idea. On the back side of our house grows a very large Rose of Sharon bush. 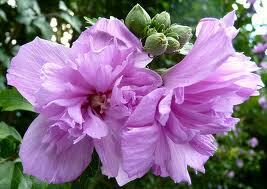 It has a purple double bloom in late summer that is gorgeous. It has dropped seed over the years and stray bushes have grown up. Two particular small ones were growing right next to the house along the foundation. They needed to be removed, and frugal one that I am, I figured these two little saplings would be perfect for my project. Just the right size to start my own topiaries, I set about to remove their roots from the soil where they were firmly attached. It was no easy task. I dug, pulled, dug some more, and pulled some more until they loosened their grip and let go. I planted the little trees on either side of the garage door and commenced the pruning process to help them take the shape I envisioned. It was snipping here and there, cutting back hard in places, positioning a stake and tying them off so they would stand tall and straight. Somehow they survived the first season. It’s been several years since that planting. There have been many clipping of branches, shaping these small trees into slender trunks with nice roundness to their leaves and flowers. They are beginning to take shape. The one on the right side really looked pretty last summer when it bloomed. They other one, however, wants to take its own shape. It seems a little rebellious. I let it grow as it would through summer, allowing the flowers to flourish. But I had my eye on it, knowing when blooming season was over, I would be grabbing my pruning shears. And that’s just what I did. When the flowers had faded and were hanging dead and brown, I began to clip away. I staked it again and pulled it into a more upright position. That little tree was pruned hard by my own hand, but by the time I was finished, it was more rounded like its sister tree a few yards away. The Lord takes us as we are but does not intend to let us stay that way. There is a pruning process going on in me. It is painful. I’m trying to be submissive. My “will” wants to; my “flesh” struggles. My Father knows best and does what He does for my good and to fulfill His greater purpose. He has a vision of what He wants me to become. I know that with all my heart, even when it does not feel good at all and I cannot understand the purpose for the pain. I have to remind myself (often!) that it’s not all about me even though sometimes I just want it to be. My little rebellious tree bears the mark of the cuts, the wounds. But spring is coming, the hope of life renewed. Spring is coming for me, too. I woke to a light dusting of snow with flakes still falling. In the still-dark morning, it was a lovely awakening. The day seemed promising and full of anticipation. But a shadow clouded my sleepy thoughts. My sweet William and I would go and share a great loss with dear friends this morning – a loss that cannot be explained, a grief that surely seems unfair. My mind went back to another December in 1982 when I waited in a hospital room while my dear mother endured a treatment on her lungs, by now infested with cancer. The treatment was simply temporary relief to her breathing. The doctor had told us she only had three months to live. His diagnosis/prediction was very accurate. It was Christmas time but there was no Christmas spirit in me. Thankfully, my extended family took my nine-year-old son with them so he could enjoy the holiday festivities. I certainly was not interested in shopping, baking cookies, or putting up a Christmas tree. My mother lay dying in a hospital bed. She wanted me with her while the treatment was being administered. I sang to her, quoted Scripture, held her hand, and tried to appear strong for her sake. I was anything but. I was falling apart on the inside. While she rested awhile after the treatment, I looked out of the hospital window and wondered where God was in all of this. How could people be celebrating the joyous season, how could I? The sweet whisper of the Spirit spoke to my heart, reminding me that Jesus came to the earth in human flesh for just such a reason as this, because of sin, sickness, and death. He came to share in my humanity with all of its joys and sorrows. I am comforted to know the prophet Isaiah called Jesus a Man of Sorrows, acquainted with my grief (Isaiah 53). While Jesus lived on this green and blue planet, He purposely clothed Himself in blood cells, nerve endings, human emotions and skin just like mine. He subjected himself to life and death, to friendship and betrayal, to joy and sorrow. And He did it all without sinning. I cannot say the same. Don’t we anticipate the days leading to Christmas as being joy-filled and happy? It is just not so for countless fellow travelers on this road called life. Even Mary the mother of Jesus, in the midst of her joyful moment of dedicating her precious baby at the temple, was given a grave prophecy by Simeon. “A sword will pierce your soul, too,” he told Mary. Sorrow is part of life just as much as happiness and joy and peace and celebrations. The final Word on it all for me comes from Hebrews 13: 5b . . . There is no greater assurance than that. And no better reason to celebrate. How are you doing with your Bible study in the book of Ruth? Dealing with the losses in our lives can be tough work. There is comfort in that knowledge. And so I wait with hope that someday I will understand. Yesterday Little Flock Baptist Church began a four-day revival. I wonder if anyone else sensed that Jesus was in the House yesterday? There was such a powerful presence during the praise and worship. I had to lift my hands in praise to the awesome God I serve. I knelt at the altar in the PM service asking God for the heart of an evangelists, naming the people I want to tell about Jesus. I expect the Lord takes that kind of prayer seriously, which means I am in for something! As I wake from sleepiness this morning, some of my first thoughts are on the ladies of the Ruth Bible study. We will not meet for class this Wednesday because we will be attending the revival service that night. I pray they are continuing their journeys with Ruth and Naomi this week. I pray for their special requests. I pray for a healing touch. I have found this to be so true. In the darkest night, Jesus shines brightest. In my great weakness, He is the strongest of the strong. When I am desperate and helpless, He alone is my Helper. May you find Him to be so to you this day, this week, on this your journey. Blessings to you all on this Monday morning. Go with God.